East Road is about the steepest part of my usual route home from the city centre; having crossed the traffic lights by the cathedral, there's little more to do than get into a low gear and pedal away, watching the scenery pass rather slowly. Hence I see this view very frequently, and have time to consider it, but I still can't decide how I feel about it. 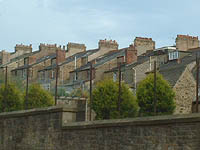 The regularity of the repeated shapes is quite striking, particularly when the sun is low and the brightly-lit end walls contrast against the dark roofs, and there's something endearing about the dozens of little chimney pots, yet there's also something crushingly mundane about the near-identical houses: little boxes for little people, all the same.